From time to time I have been ask questions on colors and patterns. This information is the best to my knowledge. When working with colors or patterns you have to remember there is two different genes. 1. The Recessive which is a heritable characteristic controlled by a gene that is expressed in offspring only inherited from both parents. 2. Dominant Genetics (of a heritable characteristic) controlled by a gene that is expressed in offspring inherited from only one parent. Recessive gene is carry by both parents. Black and tan, Chocolate and tan and most dilute colors are carried. Some of the Diluted color are Cream, Blue and tan and Isabella and tan. The Piebald pattern is also a recessive gene. The only way to get any diluted color or the piebald pattern is that both the sire and dam carry for them. If you have a black and tan dog, you may see colors like chocolate and in the dogs pedigree you know that your dog has a chance to carry the chocolate gene when bred to another dog that is chocolate and tan or carries for chocolate and tan gene. Like wise with the other colors or the piebald pattern. 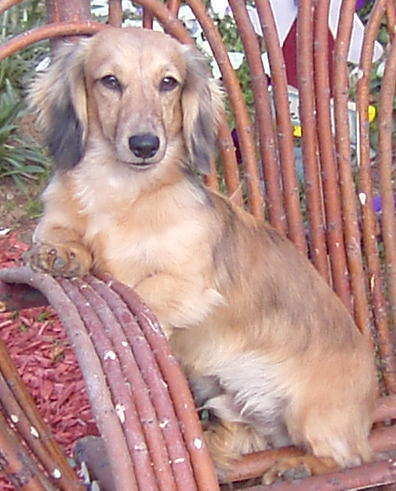 Dominant genes are the merle or dapple, brindle pattern also the wirehair coat. Only one parent has to carry the gene. If you were to take a solid puppy from a dapple breeding that puppy would never produce a dapple, unless it was bred to another dapple. A solid from a brindle breeding would never produce a brindle unless it was bred to a brindle. A smooth from a wirehair breeding would never produce a wirehair unless it was bred to a wirehair. Dominant genes do not carry. 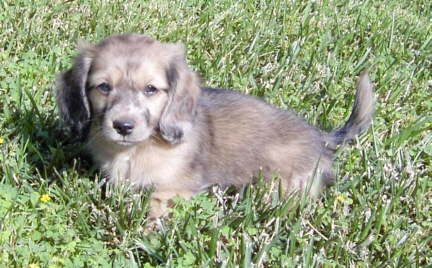 Dapple gene is a dilution gene, that is, it lightens whatever the coat color would otherwise have been. The lightening is not spread evenly over the coat, but leaves patches of undiluted color scattered over the dog's body. Also, the lightening seems to work primarily on the black pigment in the coat, any tan on the face stays even. Note that "black" is used here includes chocolate or other colors like red, fawn, cream, blue etc. But dapple gene is completely dominant. Meaning only one parent has to be it to produce it. It does not carry. Double dapples, often called a double merle or a homozygous merle, will have a large amount of white on them. The white is a mutation that can cause deaf or blindness, often with other physical problems. Some double dapples puppies can be born completely without eyes. I have seen this my self when visiting different kennels. They can allso have no health problems what so ever. When breeding two dapples together you are producing a recessive white lethal factor , lethal mutant or mutation. This recessivve gene only found in the dapple or merle pattern leads to the blindness and deafness . Regular dapples are never effected by this and are as healthy as any solid dog. It is recomemended to breed a solid to a dapple for healthly off spring. The only way this double dapple can be produced is by breeding together two dapples together in such a cross, one fourth of the pups will be solid colored, half will be simple dapples, and one fourth will be double dapples. Deafness and reduced vision are only passed on in future double dapples, and not in the simple dapple-patterned offspring. Blue eyes are seen in the dapples or merles. The blue is caused from the dapple showing in the eye. Double dapples or Double Merles all ways have to two blue eyes. The double dapple will produce only dapple off spring, So all of there puppies will be dapples when breed to a solid dog. Dapple to Dapple breeding are only for the very experienced breeder who knows there lines and what they will produce. 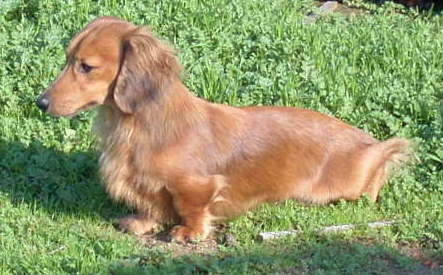 The double dapple is no longer recognized as part of the AKC Dachshund Standard as of 2007 by the DCA and AKC. It also only takes one spot to make a dapple. In some reds or creams it can be very hard to tell if they are solid or dapples. This should be done at birth when the spots are readily seen to the human eye. My cream Charlie is a dapple, he was born with spots, as he became older it has become harder to see his dappling. He produces dapples puppies. His sire was a beautiful red. He was sold to me as a solid, since he produced dapples we soon learned he was a dapple not a solid. . Most breeders can tell at birth that they have dapples. So please keep this is mind it one parent is a dapple and the puppies have spots when they are born, that puppy or puppies are dapple, even if they fade with time. red dapple. His dapple marking became harder to see the older he became. Charlie as a puppy. He was about eight weeks old in this picture. You can see his dappling on his face, ears and body. Charlie now very little dappling shown to the eye. I have been ask time after time what would I get if I bred my dapple to a piebald. 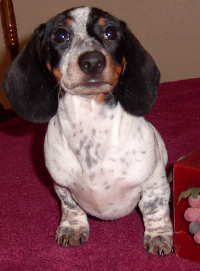 Since the dominate gene is the dapple or merle gene and you would be breeding the piebald gene which is a recessive. All you would get is solids or dapples that carry the recessive piebald gene unless your dapple carried the recessive piebald gene. Then you may end up with dapple piebald's. This is normally frowned on by most breeders and the AKC . Because of the mixing of two different patterns. The recessive piebald gene does not carry the lethal white gene. 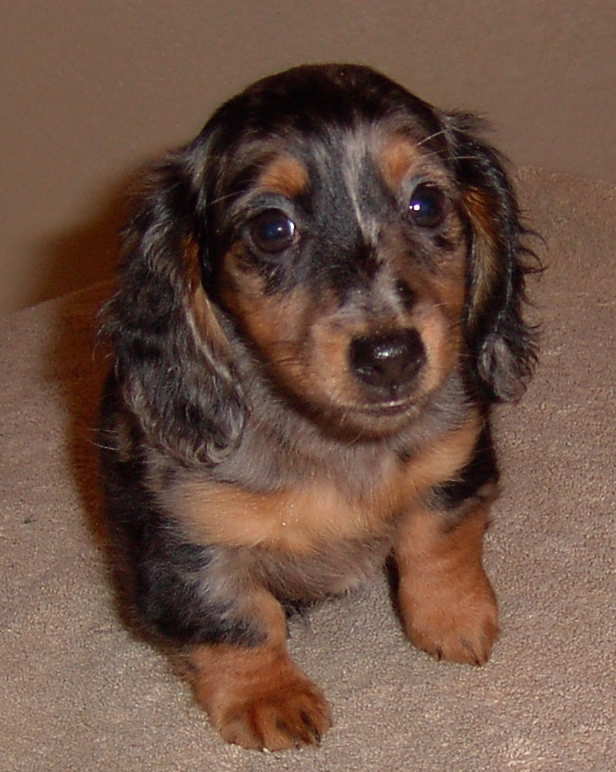 Unlike the dapple the piebald will never have blue eyes unless that dog or puppy is a piebald dapple. White spotting is Irish white spotting in a dachshund. This would include any amount of white on a dachshund they should have four white legs, a white tipped tail, and a white chest. An 'extreme piebald white spotting'. This is where more than 80% of the coat is white like my Snoopy. They can appear with any color. Piebald is recessive which means both parents must be showing or carrying for it to appear. True piebald's bred to true piebald's always produces am entire litter of piebald pups. 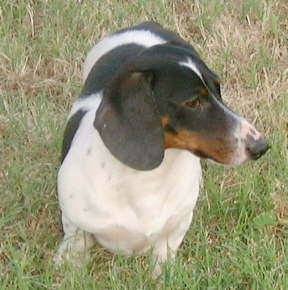 The Piebald pattern can appear with the dominant patterns brindle and dapple patterns. AKC will now register a brindle piebald but they will not register a dapple piebald. Piebald is a safe means of creating white dachshund color, not lethal like dapple gene. Dapple piebald's often have one or two blue eyes - a solid piebald or brindle piebald will never have blue eyes only brown eyes. 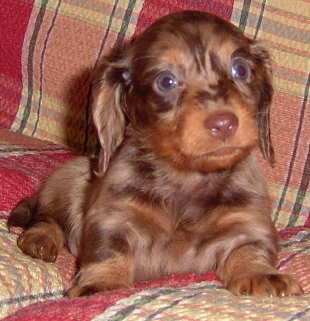 It is impossible to have blue eyes on a dachshund without the dapple pattern. White spotting can have ticking which looks like someone took a pen or marker and put little dots of color in the white. When tickling is present it can vary in from one single spot to an abundance of spots all over the body forming a roaming effect, similar to that seen in English Setters. Ticking is dominant only one of the parents needs to be ticked for ticking to appear. His sire was a red piebald and his dam was a solid black and tan carry the recessive piebald gene. Black and tan piebald with ticking.